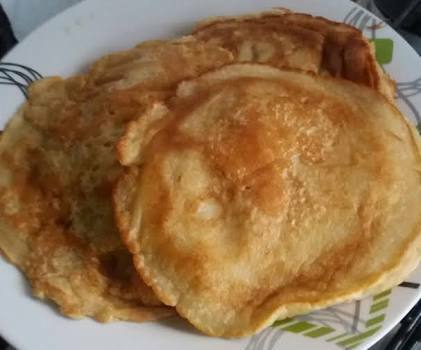 Have you ever craved for a fluffy light pancake but you don’t get the right mix for it? Well that has been my case for years until I discovered this mix. So here, want to share My fluffy tasty pancake mix, the best that I have used. Actually In my pancake recipe journey, I discovered this recipe and I promise you it’s great and you should give it a try. Kids loves it, yeah my kidos do. First off I did a pancake mix to be able to get the perfect pancake cos I have tried so many recipes that turned out imperfect for me. The mix can be stored in an air-tight container and can last for 3 months which I think you won’t keep up to. •Mix well and store in an air tight container. •1 cup of warm water( that’s if you want a light pancake) but if you prefer heavy one reduce the water. •A pinch of cinnamon if you desire. •Mix to a paste, add oil and the remaining water. •Heat ur pan in a medium heat. Tried it???? Share your comments with me. Oh my gosh I love pancake, have you tried the healthy kind made of banana? Sure I have and it's great. I have also made banana oats pancake. very Healthy. This is cool, Thanks for sharing. Making my mix soon. Wow very yummy pancake, I love it so much. I am sure trying this out Julia. I have not made any fluffy pancakes so this is definitely a go for me! Thanks for sharing!